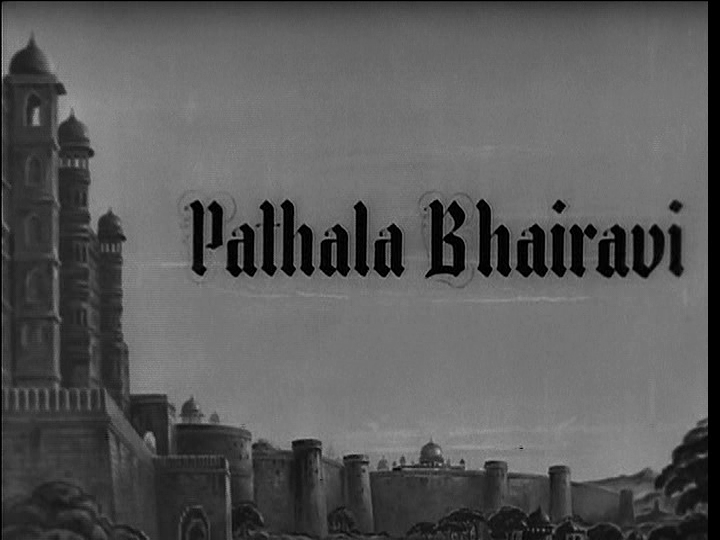 Patala Bhairavi is a wonderful fairytale complete with a pauper turned prince, a wicked wizard, a princess, a quest, flying castles, magic, disguises and divine intervention. This is not a stuffy staid classic; this is fun! I watched it without subtitles, but the story is clear and easy to follow. 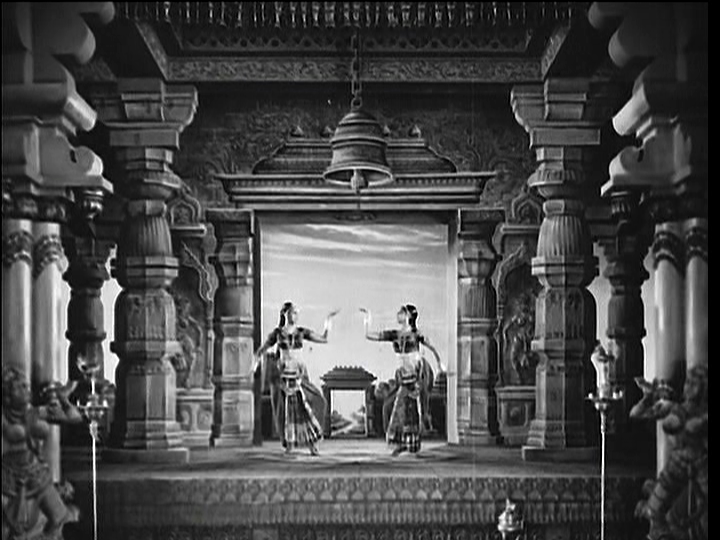 And the cast is fantastic – NTR, Malathi K, SV Ranga Rao , Relangi – and a young Savitri makes a small appearance. 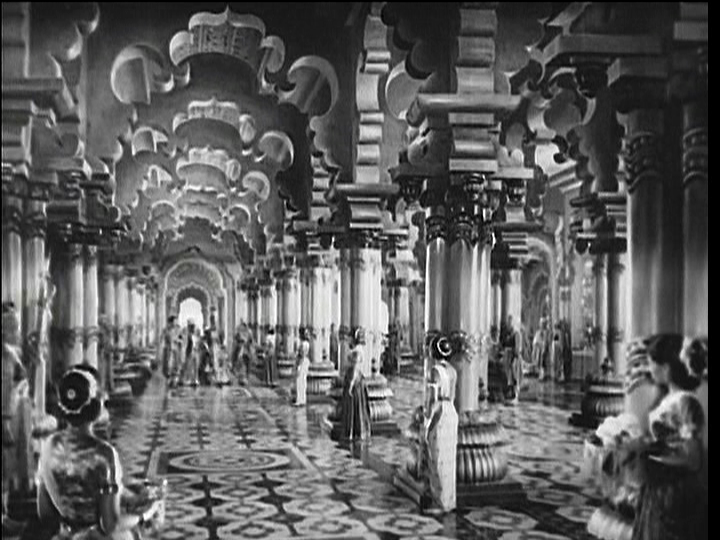 There are beautiful sets as well, and lovely music by Ghantasala. It really is a feast. Thota Ramudu (NTR) lives with his mother Kanthamma the palace gardener (Surabhi Kamalabai) and his sidekick Anji (Balakrishna). 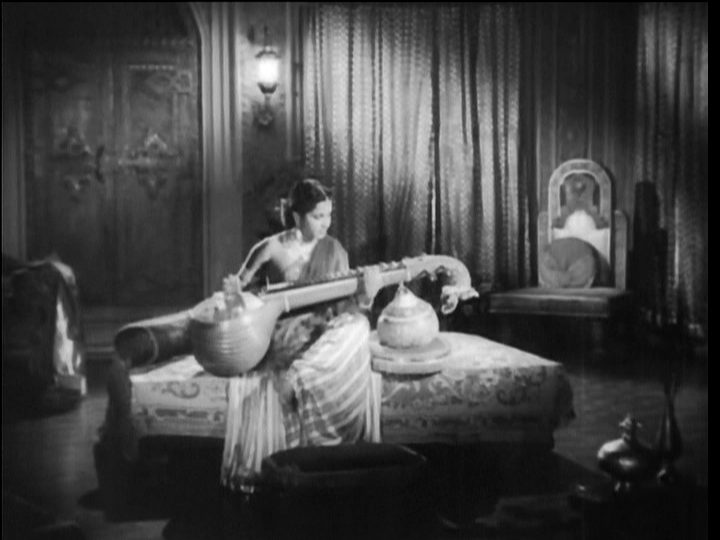 He spies the princess Indumatha (Malathi K) and is smitten. Her father is not as enamoured of the idea, and tries to deter the youngsters but love will not be denied. 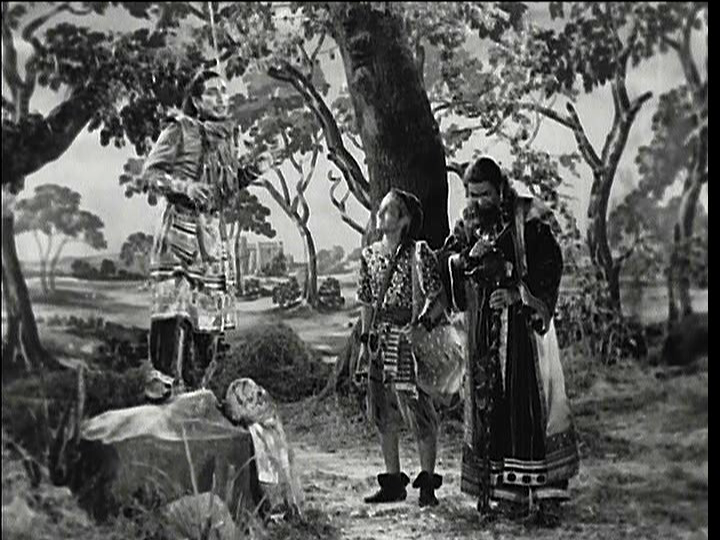 The King dreams that the poor man will be his daughter’s saviour and decides to be merciful. After being released from the palace dungeons Ramudu vows to make his way out into the world and return with the requisite riches and glory to be deemed worthy. NTR is excellent as the hero. He stands up to the king’s bullying brother (Relangi), defends those in trouble and exudes righteousness without being stuck up. He gives his mother some trouble as he and Anji are silly boys when given half a chance, but he is fundamentally a nice guy. Plus – he has snake wrangling and crocodile wrestling skills! It’s a fun role and he really embraces the swashbuckling hero style. He also gets to do romantic and dramatic scenes so there is a range of emotion and intensity. NTR balances it beautifully. Had the performance been tipped more towards silliness or self importance, it would have been a lot less enjoyable. 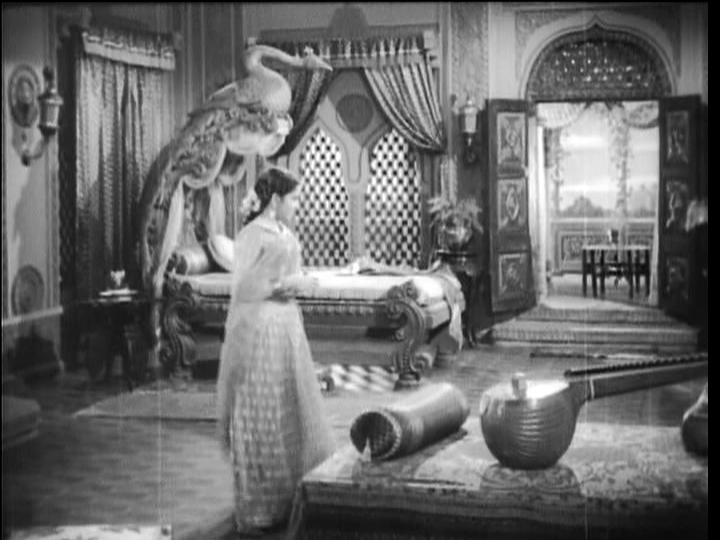 Indumathi is a proper princess. She lives in a palace, indulges in approved princess pastimes like singing to flowers and playing music, and after an exhausting day of these activities she sleeps in a peacock bed. Indumathi doesn’t do much except wait…wait for her sweetheart, wait to be married, wait to be rescued. Malathi K made a strong impression in her later scenes when she is fearful and alone, but Indumathi is off screen for a lot of the film so she has little scope. 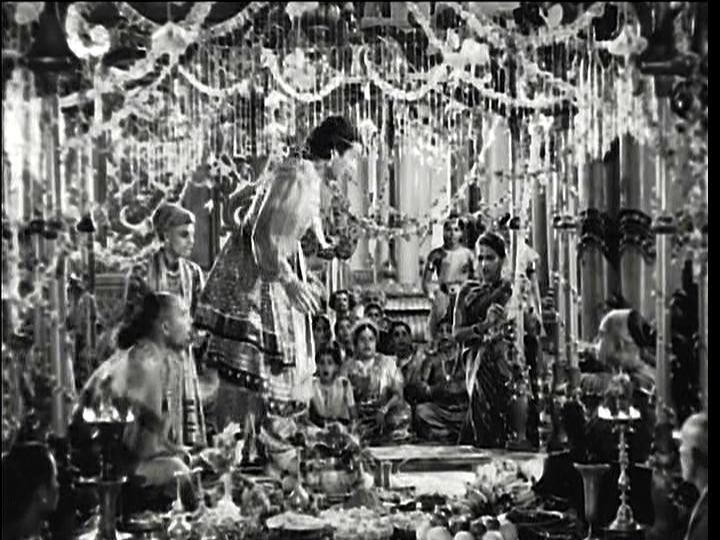 Relangi plays the king’s relative, and is NTR’s rival for Indumathi. There is little to fear on that front however as he delivers his habitual bumbling fool performance. He does have an eye catching hat though, so that was something. And he does his own singing. He and Balakrishna have ownership of the comedy track, and it is fairly amusing as the jokes are integral to their characters. Anji is by Ramudu’s side for the adventure, and he contributes a little bit more than just comedy, although that is his primary purpose. In the battle of the sidekicks between Anji and the sorcerer’s apprentice Dingiri (Padmanabham), Anji wins the day. He is loyal and resourceful, if a bit dim, and without him the hero might have failed miserably. Considering I usually find the comedy sidekick more irritating than entertaining, I think he did really well to keep me from fast forwarding through his solo scenes. SV Ranga Rao is Nepala Mantrikudu, a sorcerer who needs to sacrifice an innocent young lad (I wonder who will fall into his hands) in order to gain control over an idol that can compel goddess Patala Bhairavi (Girija) to grant wishes. 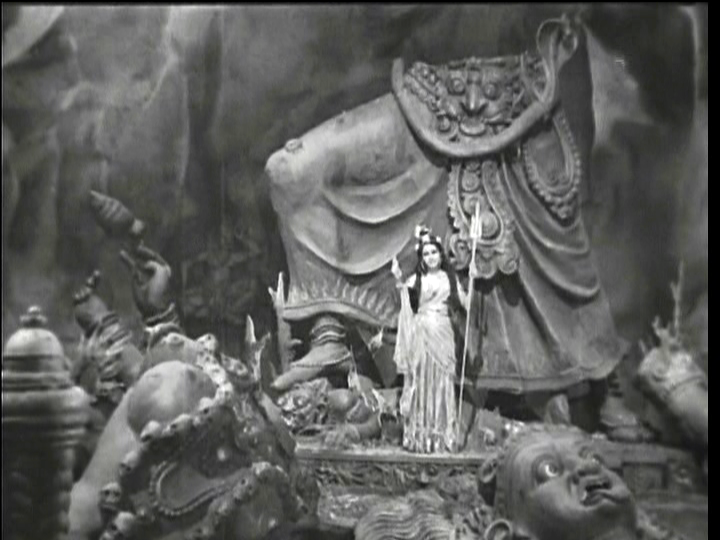 He has a fabulous cave lair with excellent statuary, and the hapless Dingiri as his assistant. Nepala Mantrikudu is a determined man, who will stop at nothing to gain his desire. He even cut his own arm off once for a spell, and then used his magic to reattach it. I like his dragon headed telescope that sees whatever the user wants to find. 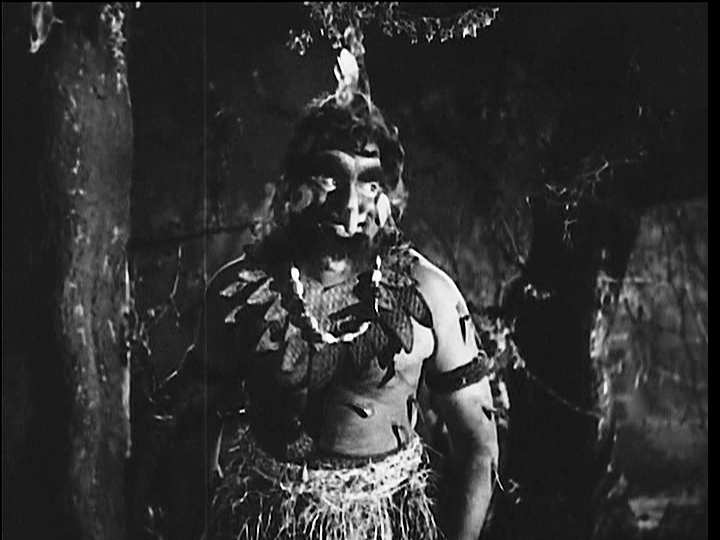 He impresses the yokels with a great array of tricks – including turning a rock into a monkey and then transforms the monkey into a dancing girl before giving Relangi similar treatment. Ramudu can’t resist the show, and that brings the protagonists together. 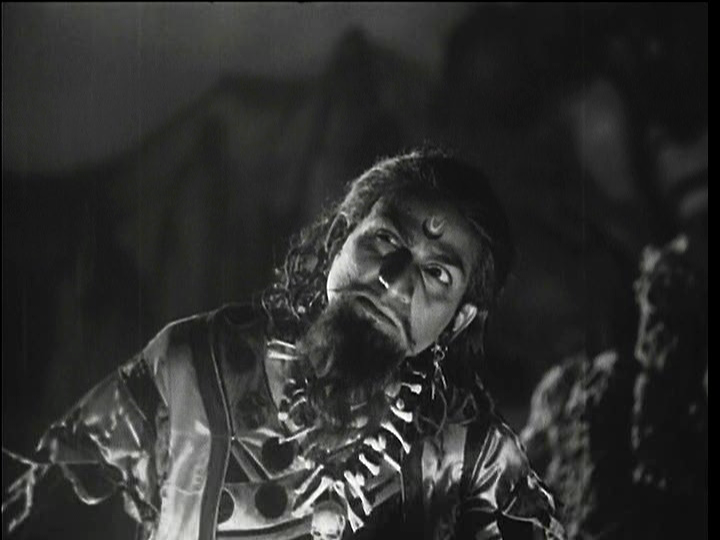 I always like SV Ranga Rao as a villain because he can be amusing with a twinkle in his eye and then turn to seriously threatening in a blink. He adds most of the drama and menace to the story, and is larger than life. 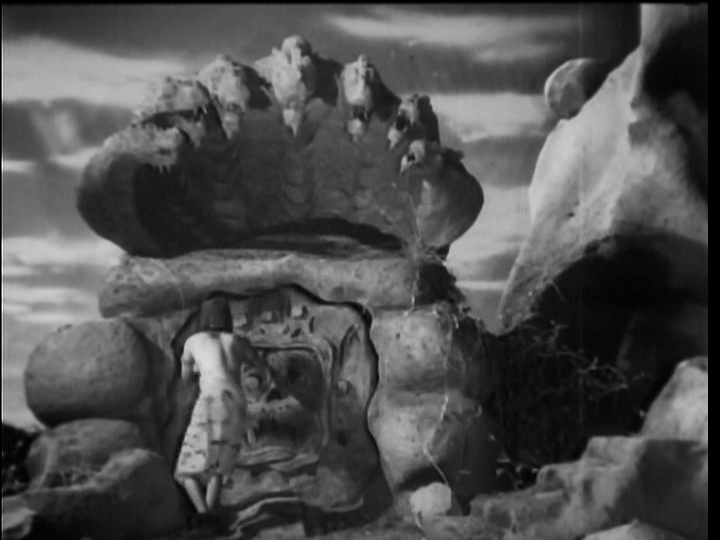 Ramudu steals a magical vessel and tries to create his own wealth. But he lacks the ability to use it so, promised money and the princess, he goes with Nepala Mantrikudu to retrieve the idol. The quest involves a lot of near death moments for NTR including – the crocodile wrestling! Not the most lifelike crocodile, nor the most convincing wound I have seen. I shall digress – I keep hearing rumours that Rana Daggubati may be in a remake of this film. I think he is a competent actor although I’m not sure he has the right acting style for this sort of caper, but I do think he might be excellent at shirtless crocodile wrestling scenes. 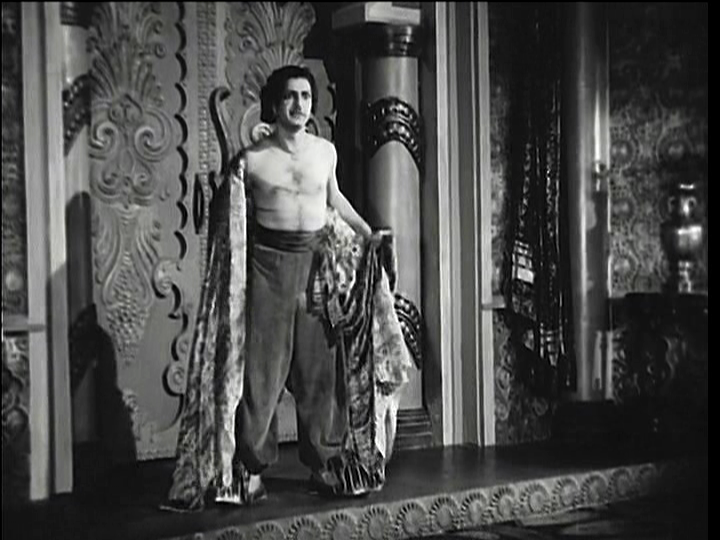 Ramudu emerges from his dip triumphant, and worded up about the magician’s treachery by a goddess in the crocodile pond. Of course the sorcerer and his intended sacrifice have different ideas, and Ramudu wins that encounter and the idol. While he is rich (thanks to the goddess) on his return to Ujjain, he is not out of trouble. It takes more than decapitation to stop a dark sorcerer who has a history of sticking his limbs back on. 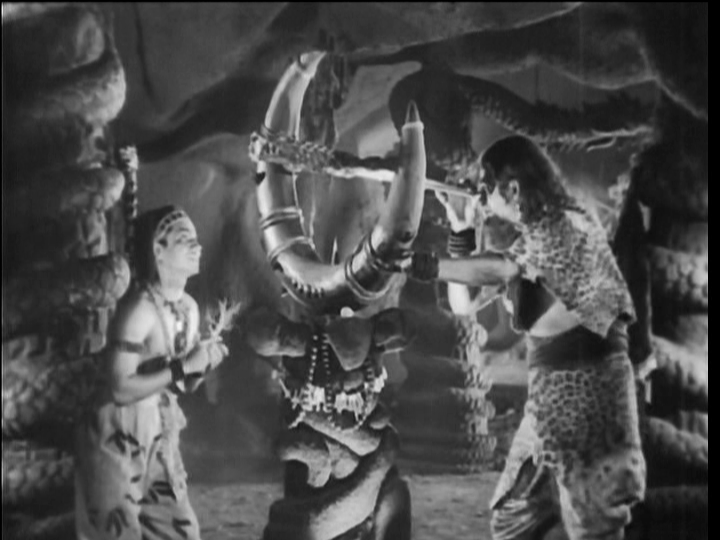 Old enemies unite against Ramudu and he loses control of the idol. What next? There are demons, bears, seven-league boots, invisibility cloaks, disguises, flying palaces, fisticuffs and so much more before the end of the tale. When I say the sets were lavish – there are 3 separate credits for set design, moulding and painting and I think they earned their keep. When Ramudu takes the royal family on a tour of his magically appointed residence, the building is stunning. 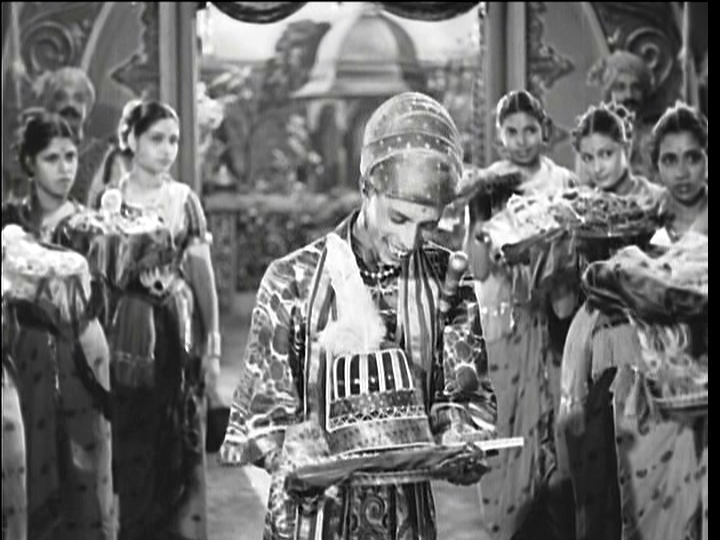 This song includes some performances by his household dancers (including Savitri), and the sets are just delightful. I’ve screen capped if you can’t be bothered with the song clip. 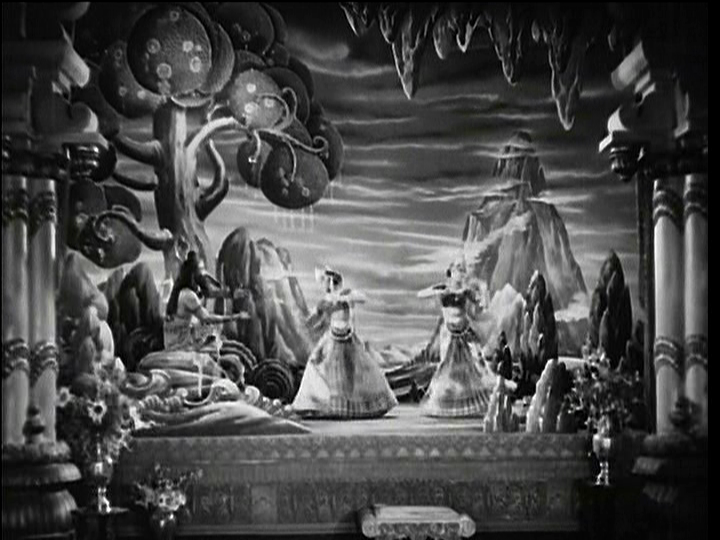 The visuals perfectly match the story book action and characters, with the painted backdrops reinforcing the fantasy element. 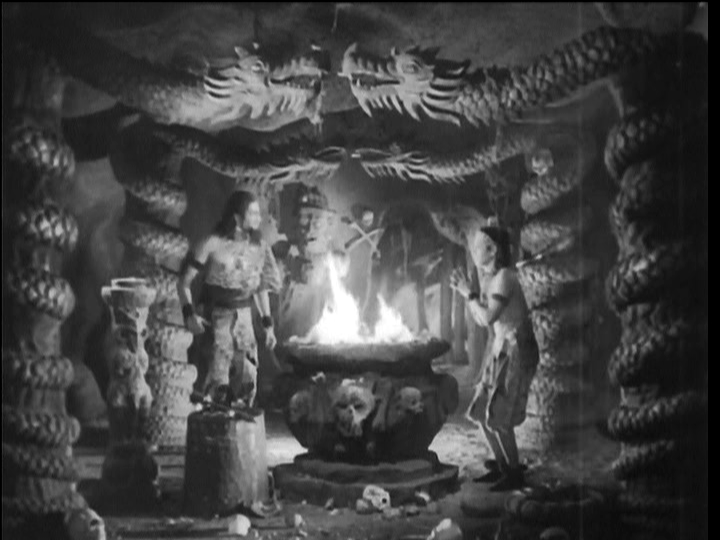 The special effects are lots of fun (especially considering it was the 1950s). I saw Sri Rama Rajyam on Friday night and despite the apparently huge budget for CGI, I found the effects more distracting than beautiful. I know that is a devotional film, and this isn’t but it made me think about the use of visual effects in films that are depicting an alternate reality. Patala Bhairavi keeps the people at the centre. When someone pulls on an invisibility cloak, other characters react to this amazing sight – the gimmicks support the story. 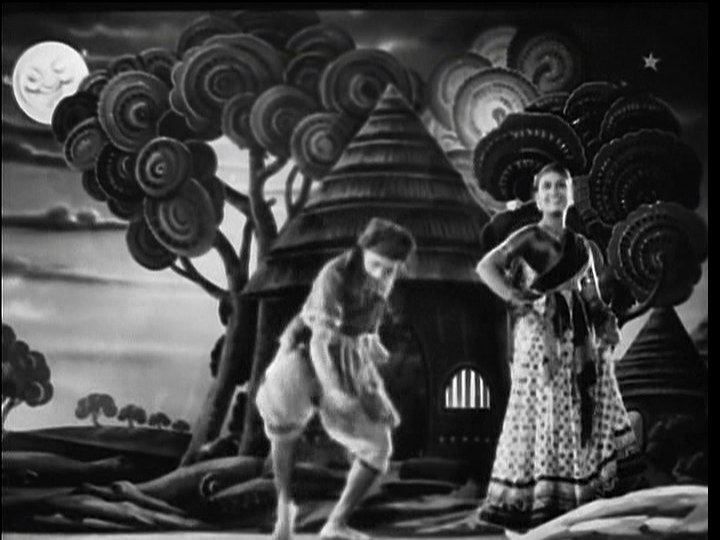 In Sri Rama Rajyam, they chose to use CGI for things like birds, leaves, foliage, peacocks and deer to the point that it cluttered up the screen. It detracted from the story and from the actors. I appreciated the mastery of Kadri Venkata Reddy. He and the team including writers Subbanna Deekshitulu, Kamalakara Kameshwara Rao, Pingali Nagendra Rao art director Madhavapeddi Gokhale and DOP Marcus Bartley have created a really beautiful fantasy realm with an engaging story. Perhaps I am fond of this film because it reminds me of being a kid, watching Disney TV shows with my family on a Saturday evening. The good guys are nice, there are pretty jewels and costumes to admire, the music is lovely and the story ends on a high note. I would love to see it with subtitles but I enjoyed it immensely without. 5 stars! This entry was posted in Tollywood and tagged Adventures without subtitles, Balakrishna, Classics, Ghantasala, Girija, Kadri Venkata Reddy, Kamalakara Kameshwara Rao, Madhavapeddi Gokhale, Malathi K, Marcus Bartley, NTR, Pingali Nagendra Rao, Relangi, Relangi Venkata Ramaiah, S.V. 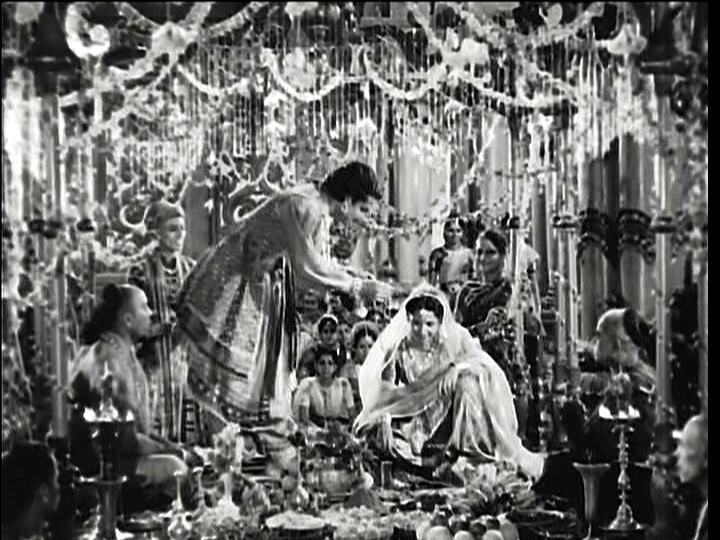 Ranga Rao, Savitri, Subbanna Deekshitulu, Surabhi Kamalabai, Telugu, Tollywood. Bookmark the permalink. 1. I havent watched the complete movie yet… and after reading this review, I should go out, buy a DVD and watch it.. I would watch this just for the architecture of the sets. Truly amazing! And when you say “peacock bed,” you aren’t kidding! A few tidbits for you: Most of the behind the camera crew you mentioned went on to become the leading lights of the Telugu industry in their respective fields, so it’s not surprising that they should all work together so well to bring this to success. This was NTR’s “breakout” film, the one that made him into a star. Before that ANR was the big star, and also in the same genre of films. After this and a few more, ANR pretty much got out of this fantasy/folklore genre, as well as the religious one, pretty much ceding both of them to NTR, and sticking primarily to contemporary socials. NTR was a dominant force in all genres. 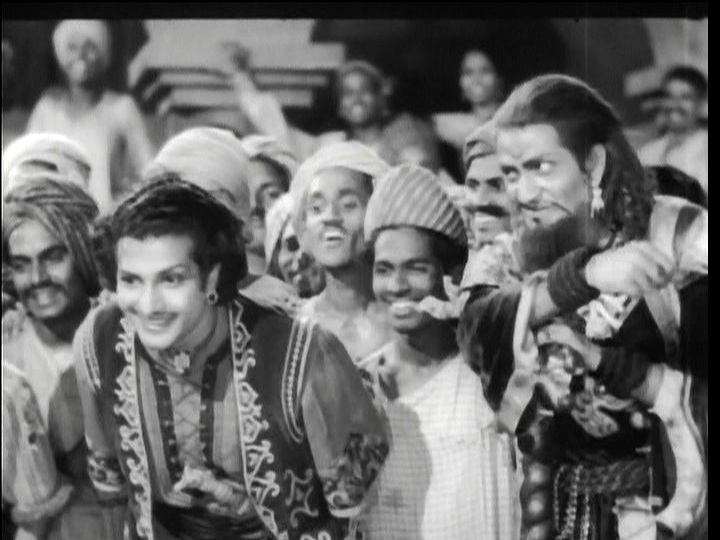 Balakrishna and Relangi were *the* comedy actors of early Telugu cinema, and are still held up as the standard to which no one following could match. I don’t know if you’re aware, but Padmanabham also became a comedy star (due primarily to his short stature, I guess, since he was a fine actor in every other way as well, and did a few dramatic roles), and was the successor to Relangi as the “go to” guy for comedy after the 1960’s. His comments on today’s “comedy” are pretty scathing. But what this film illustrates is that, in the “golden age” days, they didn’t have separate “comedy tracks”. They had actors who specialized in comedy (due mainly, as I said, because their appearance wasn’t deemed worthy of being a hero/heroine), but the roles they played were integral to the plot of the story. There was already a kind of “remake” of this film, called “Bhairava Dweepam”, starring NTR’s son Balakrishna. It did well enough at the box office, but the producers didn’t follow up with more of the same. However, it wasn’t an exact remake in terms of story, but more a “spiritual” remake, with the same kind of fantasy setting and story. I think Rana Daggubati would be terrible in a remake! I actually think NTR jr. would do far better, because he would be more convincing as both the village innocent exploited by the magician, as well as the valorous fighter. Sorry to go on at such length! But I just want to say one more thing. I will be seeing Sri Rama Rajyam next week, and have read one very negative review in a Telugu email list. The reviewer specifically mentioned that all the CGI was distracting, and you’re confirming his impression. Interesting. I’m very glad that your exposure to another of the “classic” Telugu films has been a success, like the previous one for Maya Bazaar. Now that you’ve become so savvy with unsubtitled films, I urge you to check out the film considered to be the all time classic, Malliswari, with Bhanumathi and NTR. Again, the story is fairly simple to follow (especially if you read a synopsis first), and the music is considered to be the highlight. Hi mm. Thanks for all the background. I can’t imagine a remake of this film to be honest, but if they did I do know I would prefer to get an eyeful of Rana than NTR Jr when it comes to shirtless crocodile wrestling 🙂 They would have to do well to beat Chiru’s croc wrestle in Adavi Donga though! I’m not sure that a film like this could be remade as it is in many respects non-commercial by today’s standards, and I don’t think the likely changes would enhance it in any way. I do have an unsubtitled copy of Malliswari and will get to it. I need to be in the right frame of mind to watch the older un-subbed films as they do take a lot more concentration. As for picking up Telugu, well it is inevitable that you pick up a few random verbs and things over time but I rarely understand more than a word every few minutes. I just have to pay attention to tone, gesture and context and hope that is telling the story. One benefit of older films is that actors did tend to enunciate more clearly than modern stars do – I find that in Telugu and Hindi in particular – so if one of my few recognised words is in there, I will hear it! Patala Bhairavi is full of familiar fairytale type characters so to an extent, while there was a lot going on, the underlying story is simple. you are the only other person apart from my father who I have seen being so obsessively passionate about this film! she writes about her learning the language as well as review of films that she is seeing, currently she is at Shankarabharanam, i would be much obliged if you could leave an encouraging comment on her attempt. meanwhile, i am taking a print out of this review for her…. If there is only one line to be learned in Telugu, I highly recommend, “Naruda, emi nee korika..” :D.
When I first watched this one I saw the shades of Aladdin in it. But then it is such a delightful mix of so many other folk tales (reminded me parts of “guna sundari katha” and “keelu gurram”, with rescue mission). I find it interesting that NTR and SVR (S.V. Ranga Rao) were portrayed with almost equal weight here and in “Shavukaru”. Then gradually SVR becomes older and older character than NTR in the later movies, and finally cast as his father in “Gundamma katha”. 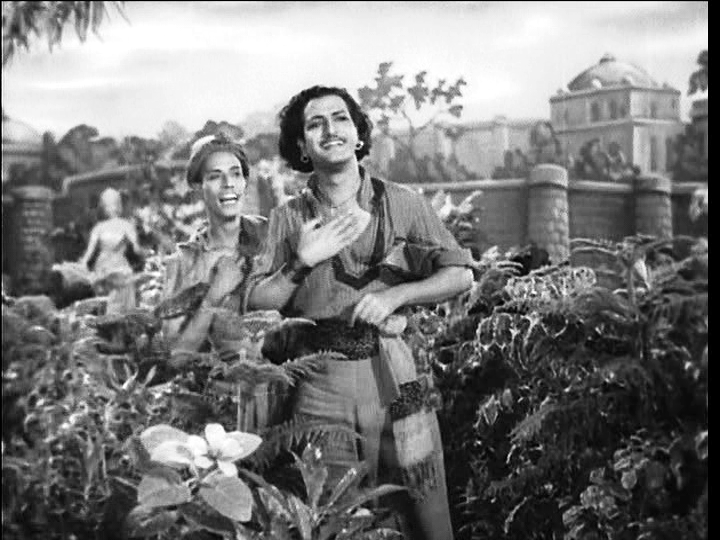 I loved him in Mayabazar and he was very good in Narthanasala too. A marvelous master piece is ‘Narthanasala’; crowning glory-all of it is “SVR”. Doubtless, he had stole the show in its midway through.